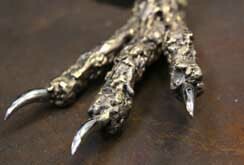 These dragon sculptures are created by Verdigris' proprietor David Hyde. David carefully welds small pieces of steel, bronze or stainless steel together. Over the years he has built up a large and diverse repertoire of skin textures through constant experimentation and a thorough exploration of the welding process. One technique he finds particularly effective is the fusing together of different metals such as bronze and stainless steel to create whole new families of alloyed metals; each with their own tone, colour and character. The inherent beauty of these different metals and their juxtaposition is enhanced by the deep and revealing polish he gives to the sculptures before completion.